Sitting Pretty or Trading Ahead? We’ve all been there, a bottle we bought to share and enjoy somehow doesn’t get opened straight away and ends up at the back of a shelf or cupboard. We forget about it, sometimes for weeks, sometimes for months or even years. 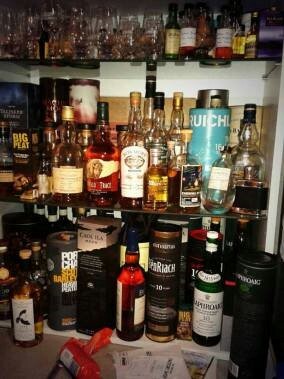 Then one day we are cleaning our cupboard out or checking our whisky inventory, when we come across said bottle. We smile a little at hidden treasure or even dance a little jig of joy, we take it out, get a glass and get ready to open it, and the day has finally come when the bottle comes of age! Or does it? We take a moment to think, we realise that this bottle is now discontinued and unavailable in most shops, certainly at the original price. The last time you saw this bottle it went for three times its original selling price at an auction house. So what do you do? Open it and be thankful that a piece of unattainable whisky has been found? Or do you think, I really need extra money this month, maybe I should just sell it? This scenario can raise numerous dilemmas. You may have always thought that whisky is for drinking and people that make money from buying and selling it are unethical and just vagabonds. You may just feel that making extra cash from a whisky that you know somebody else will really enjoy is a bit offensive. Or you may just feel that it is against the whole ethos of whisky and the #whiskyfabric. Let’s get one thing clear though, whatever you decide to do with that whisky is entirely your business, you paid for it and if you want to have a bath in it, then be my guest, or if you want to drown it with Scotland’s other national drink, Irn-Bru, go for it. The whole business of buying and selling whisky for profit has come back to prominence in recent years, due mainly to the success of the whisky industry, something that should make us all grateful, more whisky produced means more whisky for everyone, right? Well no, because not all whiskies produced are done so in large enough quantities to quench the thirst of everybody that wants it. The selling of whisky for profit is a very contentious area, some people are fervently against it, others practically advocate it and there are quite a few fence sitters. Let’s look at the different type of “Whisky” people out there and their opinions on the trend of selling whisky for profit. Drinkers – The person who goes out, buys a bottle of whisky, gets home, and opens it. Whisky is made for drinking, so why not drink it? They might not open it straight away, but that bottle will be opened by that hand, at some stage in the not too distant future. These people are usually against the thought of selling whisky for profit. Collectors – This whisky lover is closely related to the drinker, they love drinking whisky, sharing it with friends, even going to festivals and using social media to tell everybody of their love of whisky. They do also like collecting things, and having gotten too old to have a healthy interest in Pokemon they moved onto a new hobby. They may pick up bottles just from a certain region, or a single distillery, they even may be lucky to be able to afford whisky distilled in their birth year (that shipped sailed for me many moons ago). They will happily display it on a shelf and look at it for years to come. When times become difficult they may sell a few bottles to help fund newer bottles to drink, they feel that it is fine to sell whisky and in some cases may not even make a profit out of it. Investors – These people are closer to collector than drinker. They may love drinking whisky and everything that goes with it but they make no pretence that they are in the business of buying whisky to make money from it, maybe not straight away but in the future. They may remember overhearing a conversation in the pub about how somebody’s friend picked up a case of whisky 5 years ago and sold it for five times its original value. On the other hand they may despise whisky, the smell, the taste and everything about it. They only want to make money and are happy to let people know that. Hoovers – This is the ultimate whisky for profit person, they will queue overnight for a brand new distillery only special release of 100 bottles and then try to sell it the second they have bought it (See Feis Ile for examples of hoovers). They will do anything to get that bottle that will make them a quick profit and don’t care who knows what they do. These four groups of people co-exist in the whisky world and you could easily say “Why not, it’s a large enough world for everybody?” The trouble is how do people that are drinkers get a bottle that they have really got their eye on, when a hoover has come along and got it first? Is it just tough luck for the drinker or should they have priority because they are going to do what the distilleries want them to do, and actually open the bottle? (Or do distilleries actually want that? More on that later) A lot of people would say that these drinkers are the lifeblood of the whisky industry and without them, then whisky sales would plummet and there then would be less for all of us to buy. So what do distilleries make of it all? Are they happy to release just a single cask of approximately 200 bottles, knowing the clamour and interest that is likely to stir? Do they like the fact that there are people on the secondary market willing to chase after that bottle and pay a substantial amount over the retail price? I would say yes, their whisky sells out quickly and more people get to see what the fuss is about meaning that next time they release a limited edition the original people clamour again and are joined by the newbies. Of course a distillery want people to drink their whisky, without people drinking it then nobody would know how good (or bad) that distilleries whisky is, however, a few bottles that never get opened are not going to harm that distillery and as mentioned earlier, the clamour for the ultra-limited bottle will usually mean new customers buying something else. Win, win for the distillery. Or is it? A lot of people are now being more vocal about Hoovers and the fact that distilleries keep releasing limited whisky that most drinkers can’t get their hands on. At the moment the distilleries aren’t really harmed by the vocal minority, but in the future, maybe people will start to see that certain distilleries release just a bit too many limited whiskies and this minority will get their voices heard, stopping buying anything from these distilleries or certainly letting them know about their displeasure. The distilleries are safe, for now. The debate about selling for profit will rage on, where do you stand on it? Do you think whisky is made for drinking and therefore that’s what should always happen to it? Or are you in the camp of “It’s my money, I bought it, and I’ll do what I want”? Let me know, I like debate, and I like to hear people’s views on why this is such an emotive topic. What about me, I hear you ask? Well, I’m a collector, I have bottles in glass cabinets to look at and others squirreled away for a rainy day, they may be sold to allow further purchases, or they may be drunk. It doesn’t make me a bad person, I love whisky, love to drink it and love the people I have met through their love of whisky, I even met my fiancée that way! Stewart is co-owner of Whisky Corner, whisky.corner.co.uk. Follow Stewart on twitter @StewartCraigon and @WhiskyCorner, you can also find Whisky Corner on Facebook and Instagram.